The BF362 is a front-loaded subwoofer system, for both permanent and portable applications. 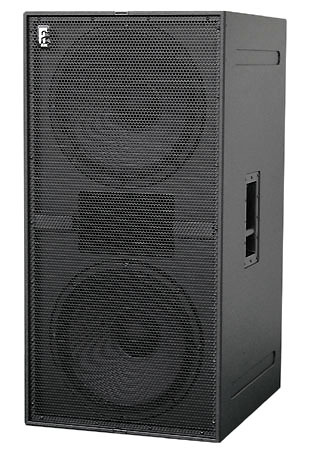 Featuring double 18” long-excursion high-power woofers (with vented double-spider frame), the BF362 delivers high quality, tight and accurate subbass response. The SIS pre-wiring ensures complete cable/ connector compensation between ALC and BF362, further increasing response accuracy. Special attention has been paid to the tuning of the system; Target was to combine deep sub bass output with substantial kick-bass. With a limited boost in the lower octaves, response can be further extended. Typical applications for the BF362 include sub-bass extension of main sound systems, used in multiples depending on the application and low frequency requirements. For full system performance, we recommend using the BF362 in combination with an ALC 2 (or ALC 4) amplifier/controller. Driven by the ALC, the BF362 delivers maximum sound quality and output power with dedicated and inaudible (power and excursion!) protection (SDP circuit). The BF362 is available in standard version, or installation version. The BF362i (“install”) comes without handles, castor wheels and cover.